The New Year is a little more than three weeks away, and we’re working to get more functionality out before the ball drops. That’s not the only improvement to the tagging experience. Besides implementing the enhanced tag picker, we’ve also reduced the set of available tags in the tag picker based on an evaluation of the quality and quantity of tags on existing content. With fewer (and less confusing) tags to choose from when creating content, we expect to see improvements in content engagement and discovery. Email subscriptions for tagged content: You now have the option to subscribe to two new email notification types: one that notifies you when a blog has been posted with a tag that you follow and another that notifies you when a question has been asked with a tag that you follow. 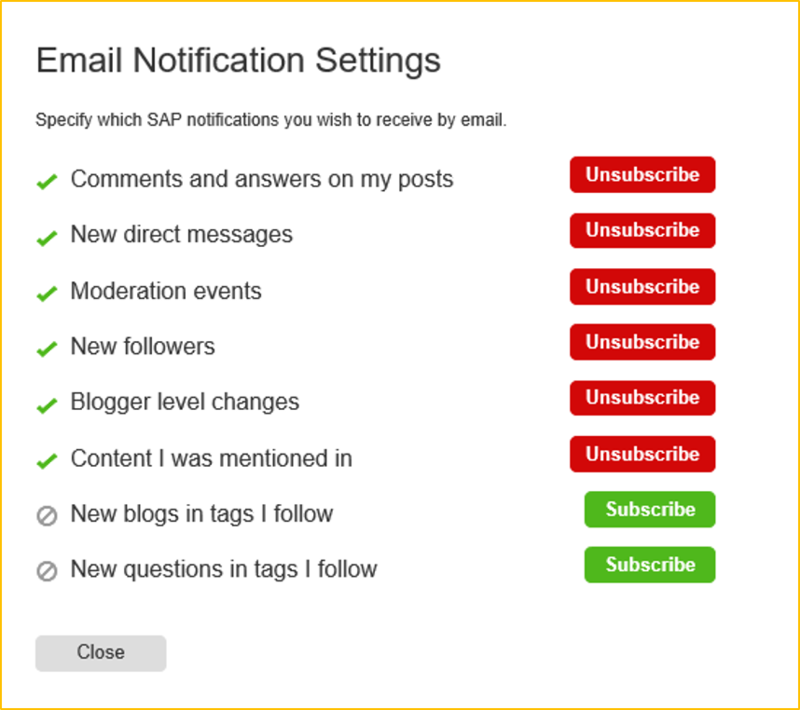 If you’re interested in receiving them, simply go to your Account Settings and subscribe to the appropriate email notification (as shown below and as described in the “Email Notifications from SAP Community” blog post). Please note that these new email subscriptions are the first phase in a three-phase approach that will make more and more email notification types available further down the road. For even more information about activities and notifications, please see the Activity Stream and Notifications page. Several bug fixes were also made with this release. One addressed a problem that generated a great deal of conversation recently. In summation: When someone changed a tag for a question, the system treated all of the comments and answers for that question as new activity — so subscribers would get updates for all of this content. Now, whenever the tag is changed, subscribers will only get a single update about this action as expected. Those are the highlights for the current release cycle, but we aren’t finished with 2017 just yet. We have other improvements scheduled to roll out in the coming weeks. I’ll stop short of saying more — lest I end up with coal in my stocking for fibbing– but I hope to be back soon with a cool announcement. In the meantime, you can continue to find a convenient list of all release highlights (as well as other communications) in the Community Updates section. You can also “watch” the SAP Community: Communications Updates wiki page (option in the upper right) to get notifications whenever news occurs. Next Santa is early this year: HXE on Ubuntu is back! !